Post-transcriptional regulatory mechanisms involved in axis polarization and cell fate specification during Caenorhabditis elegans embryogenesis. Characterization of post-transcriptional regulatory mechanisms that guide oligodendrocyte differentiation and myelin formation in the vertebrate central nervous system. Identification of small molecule inhibitors of RNA-binding protein function using high throughput screening approaches. We employ a combination of biochemical and molecular genetic methods, bioinformatics, chemical biology, biophysics, and structural analyses in our studies, with a focus on quantitative measurements. Our laboratory is located on the 9th floor of the Lazare Research Building in the Department of Biochemistry and Molecular Pharmacology at the University of Massachusetts Medical School. 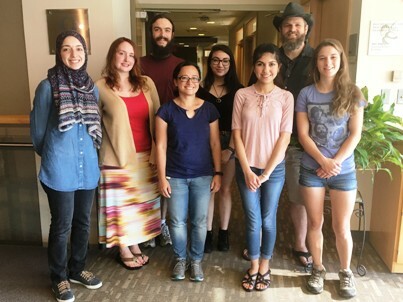 We enjoy a collaborative research environment that includes colleagues with related interests in worm biology, RNA biochemistry, developmental biology, or biophysics. Read more about our research here. A variety of rotation projects are available to study RNP assembly and post-transcriptional regulation during development using quantitative biochemical and modern molecular methods. Project 1: Characterization of the RNA-protein complexes that guide C. elegans early development. Several projects ranging in scope from biochemical characterization of RNA-binding protein complexes to genetic dissection of RNA binding protein function in development are currently available. Contact Sean for more details. Project 2: Post-transcriptional regulation of oligodendrocyte differentiation. Projects are available to monitor changes in gene expression as a function of differentiation with a focus on changes in alternative splicing and mRNA stability. Contact Sean for more details. Hu S, Ryan LE, Kaymak E, Freeberg L, Lo TW, Kuersten S, Ryder SP, Haag ES. Multi-modal regulation of C. elegans hermaphrodite spermatogenesis by the GLD-1-FOG-2 complex. Dev Biol. 2018 Dec 29. PMID: 30599151. Ryder SP. #CRISPRbabies: Notes on a Scandal. CRISPR J. 2018 Dec 01; 1(6):355-357. PMID: 30687814. Han B, Antkowiak KR, Fan X, Rutigliano M, Ryder SP, Griffin EE. Polo-like Kinase Couples Cytoplasmic Protein Gradients in the C. elegans Zygote. Curr Biol. 2018 Jan 08; 28(1):60-69.e8. PMID: 29276126. Dowdle ME, Imboden SB, Park S, Ryder SP, Sheets MD. Horizontal Gel Electrophoresis for Enhanced Detection of Protein-RNA Complexes. J Vis Exp. 2017 07 28; (125). PMID: 28784977. Tamburino AM, Kaymak E, Shrestha S, Holdorf AD, Ryder SP, Walhout AJM. PRIMA: a gene-centered, RNA-to-protein method for mapping RNA-protein interactions. Translation (Austin). 2017; 5(1):e1295130. PMID: 28702278. Ryder SP. Protein-mRNA interactome capture: cartography of the mRNP landscape. F1000Res. 2016; 5:2627. PMID: 29098073. Thokala P, Simpson EL, Tappenden P, Stevens JW, Dickinson K, Ryder S, Harrison P. Ledipasvir-Sofosbuvir for Treating Chronic Hepatitis C: A NICE Single Technology Appraisal-An Evidence Review Group Perspective. Pharmacoeconomics. 2016 Aug; 34(8):741-50. PMID: 26892974. Kaymak E, Farley BM, Hay SA, Li C, Ho S, Hartman DJ, Ryder SP. Efficient generation of transgenic reporter strains and analysis of expression patterns in Caenorhabditis elegans using library MosSCI. Dev Dyn. 2016 Sep; 245(9):925-36. PMID: 27294288. Elewa A, Shirayama M, Kaymak E, Harrison PF, Powell DR, Du Z, Chute CD, Woolf H, Yi D, Ishidate T, Srinivasan J, Bao Z, Beilharz TH, Ryder SP, Mello CC. POS-1 Promotes Endo-mesoderm Development by Inhibiting the Cytoplasmic Polyadenylation of neg-1 mRNA. Dev Cell. 2015 Jul 6; 34(1):108-18. PMID: 26096734. Bohn MF, Shandilya SM, Silvas TV, Nalivaika EA, Kouno T, Kelch BA, Ryder SP, Kurt-Yilmaz N, Somasundaran M, Schiffer CA. The ssDNA Mutator APOBEC3A Is Regulated by Cooperative Dimerization. Structure. 2015 May 5; 23(5):903-11. PMID: 25914058. Ryder SP. Personal reflection (RNA journal 20th anniversary). RNA. 2015 Apr; 21(4):725-6. PMID: 25780210. Kaymak E, Ryder SP. RNA recognition by the Caenorhabditis elegans oocyte maturation determinant OMA-1. J Biol Chem. 2013 Oct 18; 288(42):30463-72. PMID: 24014033. Zearfoss NR, Johnson ES, Ryder SP. hnRNP A1 and secondary structure coordinate alternative splicing of Mag. RNA. 2013 Jul; 19(7):948-57. PMID: 23704325. Clingman CC, Ryder SP. Metabolite sensing in eukaryotic mRNA biology. Wiley Interdiscip Rev RNA. 2013 Jul-Aug; 4(4):387-96. PMID: 23653333. Tamburino AM, Ryder SP, Walhout AJ. A compendium of Caenorhabditis elegans RNA binding proteins predicts extensive regulation at multiple levels. G3 (Bethesda). 2013 Feb; 3(2):297-304. PMID: 23390605. Farley BM, Ryder SP. POS-1 and GLD-1 repress glp-1 translation through a conserved binding-site cluster. Mol Biol Cell. 2012 Dec; 23(23):4473-83. PMID: 23034181. Zearfoss NR, Ryder SP. End-labeling oligonucleotides with chemical tags after synthesis. Methods Mol Biol. 2012; 941:181-93. PMID: 23065562. Broderick JA, Salomon WE, Ryder SP, Aronin N, Zamore PD. Argonaute protein identity and pairing geometry determine cooperativity in mammalian RNA silencing. RNA. 2011 Oct; 17(10):1858-69. PMID: 21878547. Kalchhauser I, Farley BM, Pauli S, Ryder SP, Ciosk R. FBF represses the Cip/Kip cell-cycle inhibitor CKI-2 to promote self-renewal of germline stem cells in C. elegans. EMBO J. 2011 Aug 05; 30(18):3823-9. PMID: 21822213. Ryder SP. Pumilio RNA recognition: the consequence of promiscuity. Structure. 2011 Mar 9; 19(3):277-9. PMID: 21397178. Zearfoss NR, Clingman CC, Farley BM, McCoig LM, Ryder SP. Quaking regulates Hnrnpa1 expression through its 3' UTR in oligodendrocyte precursor cells. PLoS Genet. 2011 Jan 06; 7(1):e1001269. PMID: 21253564. Wright JE, Gaidatzis D, Senften M, Farley BM, Westhof E, Ryder SP, Ciosk R. A quantitative RNA code for mRNA target selection by the germline fate determinant GLD-1. EMBO J. 2011 Feb 2; 30(3):533-45. PMID: 21169991. Pagano JM, Clingman CC, Ryder SP. Quantitative approaches to monitor protein-nucleic acid interactions using fluorescent probes. RNA. 2011 Jan; 17(1):14-20. PMID: 21098142. Ryder SP. Hidden ribozymes in eukaryotic genome sequence. F1000 Biol Rep. 2010 Jul 14; 2. PMID: 20948783. Swamidass SJ, Bittker JA, Bodycombe NE, Ryder SP, Clemons PA. An economic framework to prioritize confirmatory tests after a high-throughput screen. J Biomol Screen. 2010 Jul; 15(6):680-6. PMID: 20547534. Kaymak E, Wee LM, Ryder SP. Structure and function of nematode RNA-binding proteins. Curr Opin Struct Biol. 2010 Jun; 20(3):305-12. PMID: 20418095. Pagano JM, Farley BM, Essien KI, Ryder SP. RNA recognition by the embryonic cell fate determinant and germline totipotency factor MEX-3. Proc Natl Acad Sci U S A. 2009 Dec 1; 106(48):20252-7. PMID: 19915141. Furgason ML, MacDonald C, Shanks SG, Ryder SP, Bryant NJ, Munson M. The N-terminal peptide of the syntaxin Tlg2p modulates binding of its closed conformation to Vps45p. Proc Natl Acad Sci U S A. 2009 Aug 25; 106(34):14303-8. PMID: 19667197. Farley BM, Pagano JM, Ryder SP. RNA target specificity of the embryonic cell fate determinant POS-1. RNA. 2008 Dec; 14(12):2685-97. PMID: 18952820. Zearfoss NR, Farley BM, Ryder SP. Post-transcriptional regulation of myelin formation. Biochim Biophys Acta. 2008 Aug; 1779(8):486-94. PMID: 18590840. Farley BM, Ryder SP. Regulation of maternal mRNAs in early development. Crit Rev Biochem Mol Biol. 2008 Mar-Apr; 43(2):135-62. PMID: 18365862. Recht MI, Ryder SP, Williamson JR. Monitoring assembly of ribonucleoprotein complexes by isothermal titration calorimetry. Methods Mol Biol. 2008; 488:117-27. PMID: 18982287. Ryder SP, Recht MI, Williamson JR. Quantitative analysis of protein-RNA interactions by gel mobility shift. Methods Mol Biol. 2008; 488:99-115. PMID: 18982286. Pagano JM, Farley BM, McCoig LM, Ryder SP. Molecular basis of RNA recognition by the embryonic polarity determinant MEX-5. J Biol Chem. 2007 Mar 23; 282(12):8883-94. PMID: 17264081. Ryder SP. Oskar gains weight. Nat Struct Mol Biol. 2006 Apr; 13(4):297-9. PMID: 16715044. Ryder SP, Williamson JR. Specificity of the STAR/GSG domain protein Qk1: implications for the regulation of myelination. RNA. 2004 Sep; 10(9):1449-58. PMID: 15273320. Ryder SP, Frater LA, Abramovitz DL, Goodwin EB, Williamson JR. RNA target specificity of the STAR/GSG domain post-transcriptional regulatory protein GLD-1. Nat Struct Mol Biol. 2004 Jan; 11(1):20-8. PMID: 14718919. Strobel SA, Jones FD, Oyelere AK, Ryder SP. Biochemical detection of adenosine and cytidine ionization within RNA by interference analysis. Nucleic Acids Res Suppl. 2003; (3):229-30. PMID: 14510464. Ryder SP, Strobel SA. Comparative analysis of hairpin ribozyme structures and interference data. Nucleic Acids Res. 2002 Mar 15; 30(6):1287-91. PMID: 11884625. Jones FD, Ryder SP, Strobel SA. An efficient ligation reaction promoted by a Varkud Satellite ribozyme with extended 5'- and 3'-termini. Nucleic Acids Res. 2001 Dec 15; 29(24):5115-20. PMID: 11812844. Ryder SP, Oyelere AK, Padilla JL, Klostermeier D, Millar DP, Strobel SA. Investigation of adenosine base ionization in the hairpin ribozyme by nucleotide analog interference mapping. RNA. 2001 Oct; 7(10):1454-63. PMID: 11680850. Strobel SA, Ryder SP. Biological catalysis. The hairpin's turn. Nature. 2001 Apr 12; 410(6830):761-3. PMID: 11298426. Ryder SP, Ortoleva-Donnelly L, Kosek AB, Strobel SA. Chemical probing of RNA by nucleotide analog interference mapping. Methods Enzymol. 2000; 317:92-109. PMID: 10829274. Hess JA, Buchanan FG, Ryder S, Exton JH. Altered activation of phospholipase D by lysophosphatidic acid and endothelin-1 in mouse embryo fibroblasts lacking phospholipase C-gamma1. Cell Signal. 2000 Jan; 12(1):37-45. PMID: 10676846. Ryder SP, Strobel SA. Nucleotide analog interference mapping of the hairpin ribozyme: implications for secondary and tertiary structure formation. J Mol Biol. 1999 Aug 13; 291(2):295-311. PMID: 10438622. Ryder SP, Strobel SA. Nucleotide analog interference mapping. Methods. 1999 May; 18(1):38-50. PMID: 10208815. Szewczak AA, Ortoleva-Donnelly L, Ryder SP, Moncoeur E, Strobel SA. A minor groove RNA triple helix within the catalytic core of a group I intron. Nat Struct Biol. 1998 Dec; 5(12):1037-42. PMID: 9846872.